There are 17 Assisted Living Facilities in the Elkhorn area, with 4 in Elkhorn and 13 nearby. The average cost of assisted living in Elkhorn is $3,531 per month. This is higher than the national median of $3,346. To help you with your search, browse the 27 reviews below for assisted living facilities in Elkhorn. On average, consumers rate assisted living in Elkhorn 4.4 out of 5 stars. Better rated regions include Delavan with an average rating of 4.4 out of 5 stars. Caring.com has helped thousands of families find high-quality senior care. To speak with one of our Family Advisors about assisted living options and costs in Elkhorn, call (855) 863-8283. Elkhorn, Wisconsin, serves as the county seat for Walworth County in the southeast region of the state. Expanding rapidly at a rate of 85 percent, and with a total population of 9,895, the city has about 2,206 seniors. Elkhorn meets the need for assisted living with four assisted living facilities (ALFs) in town and 12 more communities nearby. 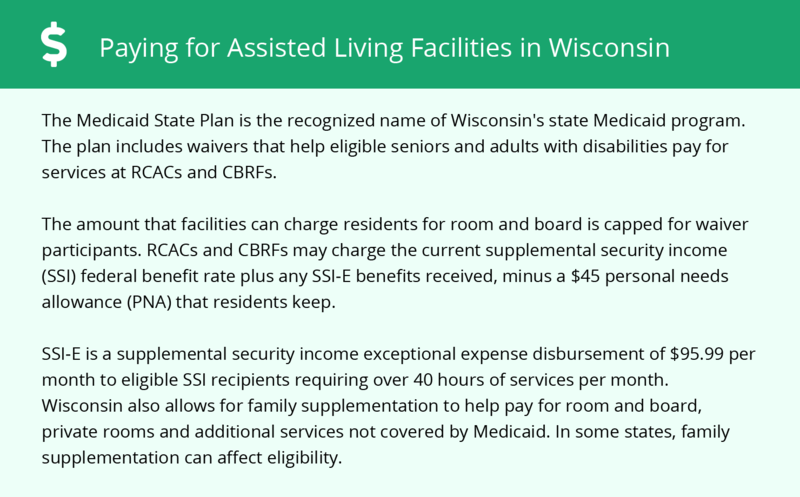 Each facility reports to the Wisconsin Department of Health Services, Bureau of Assisted Living, Division of Quality Assurance. This agency authorizes ALFs to provide seniors with services such as medication administration, healthcare, general personal care and housekeeping. Elkhorn’s climate is on par with the rest of the state, receiving a less-than-ideal Sperling’s Comfort Index rank of 43 out of 100 (100 being the best). The national average sits at 54. Seniors might find it difficult to visit friends and family, participate in outdoor events or maintain physical comfort in the winter due to higher-than-average snowfall (43 versus 26 inches per year). Crime rates in Elkhorn, Wisconsin, are comparable to national rates. Whereas the country’s averages for violent and property crimes are 31.1 and 38.1, respectively, Elkhorn’s rates are 33.7 and 35.2. Winters in Elkhorn, Wisconsin, might be physically and psychologically challenging for seniors. Temperatures go as low as 12 degrees Fahrenheit, and snowfall is heavy (43 inches annually). This can isolate seniors and prevent them from being as physically active during some months of the year. Although the Sperling’s Comfort Index is lower than normal at 43 out of 100 (100 being the best), it’s typical for the Midwest area. Seniors might notice an improvement in their respiratory health in Elkhorn, Wisconsin. The city’s air quality rank is 76 out of 100 (100 being the best), based on the EPA’s National Air Toxics Assessment. The national average is 58. Seniors can expect a small amount of tax relief living in Elkhorn, Wisconsin. The state fully taxes private pension income and withdrawals from retirement accounts, but Social Security and public pension income aren’t taxed. Elkhorn, Wisconsin, is home to world-class medical facilities, including Aurora Lakeland Medical Center, in the event of medical emergencies or illness. Assisted Living costs in Elkhorn start around $3,531 per month on average, while the nationwide average cost of assisted living is $4,000 per month, according to the latest figures from Genworth’s Cost of Care Survey. It’s important to note that assisted living rates in Elkhorn and the surrounding suburbs can vary widely based on factors such as location, the level of care needed, apartment size and the types of amenities offered at each community. 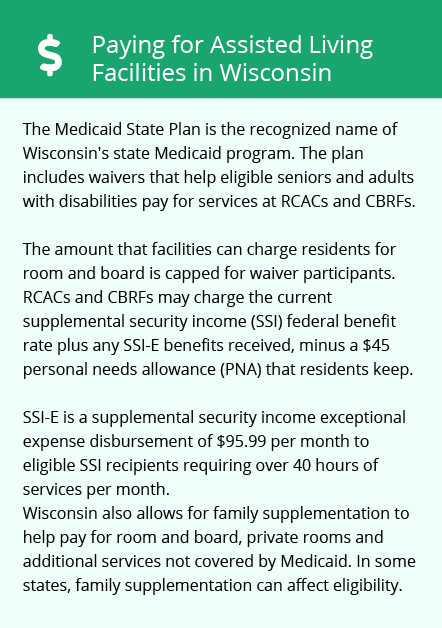 While funding is extremely limited, seniors who can’t afford to pay for ALF services out of pocket can seek the SSI Exceptional Expense Supplement (SSI-E). Elkhorn and the surrounding area are home to numerous government agencies and non-profit organizations offering help for seniors searching for or currently residing in an assisted living community. These organizations can also provide assistance in a number of other eldercare services such as geriatric care management, elder law advice, estate planning, finding home care and health and wellness programs. To see a list of free assisted living resources in Elkhorn, please visit our Assisted Living in Wisconsin page. Elkhorn-area assisted living communities must adhere to the comprehensive set of state laws and regulations that all assisted living communities in Wisconsin are required to follow. Visit our Assisted Living in Wisconsin page for more information about these laws.